Red wine and Chinese food are often thought to be incompatible. Many feel that full-bodied red wines either compete aggressively with spicy Chinese dishes or simply overwhelm them. If my dinners are any indication, this is very much the case. So when I planned the long distance wine pairing with Kirstin of Vin de la Table I decided to see if I could finally find a red wine to match spicy Chinese food. I chose to make red cooked lamb. Red cooking is a very traditional stewing method that’s popular in all parts of China. 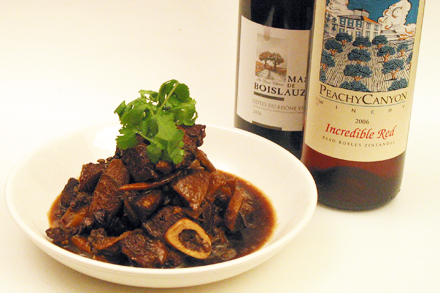 The basic technique is to braise any meat in a dark soy sauce based liquid with cooking wine and sugar, plus other spices. You may be surprised to learn that lamb and goat are commonly served in western and northern China. Indeed a large Muslim population in western China almost exclusively consumes lamb and goat as their protein of choice. This red cooked lamb recipe requires a complex combination of spices including star anise, Sichuan peppercorn, fennel, cassia bark, ginger, chili pepper and dried tangerine peel. I knew it would be very hard to match a wine with this mixture of flavors. Kirstin originally suggested two Spanish red wines, a 2006 Vina Valoria Tempranillo Rioja and a 2005 Este Tinto Almeria. Unfortunately I was not able to find any of these two wines. Another suggestion for a Rhone red of Domaine de Fenouillet Cote du Ventoux Rouge was also unavailable. In desperation Kirstin did some online research and reserved two bottles of red wine for me at a wine store near my home. I finally bought a 2006 Mas de Boislauzon Cotes du Rhone Villages form France and a 2006 Peachy Canyon Incredible Red (Paso Robles Zinfandel) from California. At the tasting dinner we didn’t think that either wine was full-bodied enough to stand up to the red cooked lamb. Many of my guests felt the Cotes du Rhone Villages is an excellent medium-bodied red wine with very nice hint of cherry and plum, but the spicy lamb was simply too overpowering. The Peachy Canyon Zinfandel however I thought was much more successful. It was sweeter and fruitier with blackberry and current flavors. I felt that the fruit in the wine did complement the tangerine in the lamb. Unfortunately my guests again felt that the spices drowned out this wine. In the end I conclude that successfully pairing red wine with spicy Chinese food seems to be truly a difficult task. Perhaps I’ll continue to look for the original wines Kirstin suggested and may be they can be better matches. Do let me know if you have any suggestion. Par-boil the lamb in boiling water for about 15 minutes and scoop off all the scum that forms on top. In a wok combine all the braising ingredients and bring to a boil. Add the lamb and simmer for about 1 hour 30 minutes. Add more water if the liquid evaporates too quickly. Add the carrot and daikon pieces and cook for another 15 minutes. Serve garnished with chopped cilantro. Kian, a gallant search for the wine, but no matter – I am loving that lamb recipe. By the way, I was tagged and thus you’ve been tagged, over at Simmer. Happy New Year – hope it’s fruitful and delicious! Hey there! So glad to have found your blog – I’m enjoying reading about your Chinese food. Jaden, Thanks for visiting! 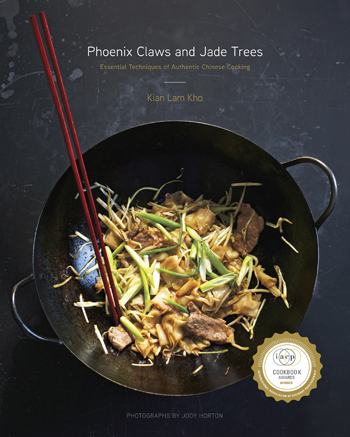 I do enjoy sharing my Chinese recipes and tips with everyone. Debs, I’m so pleased this wine pairing series is helping you make pairing decision. Good luck with your fundraising! A great looking way of cooking lamb, far from what I’d normally do (but that’s not a criticism ). Love your pairing; I’m terrible and end up choosing good wines which don’t work with the food I’ve made! This lamb looks delicious. How about a nice peppery Zinfindel with it? I made Jerk Pork BBQ this summer and a Zinfindel stood up to the spice. Sorry I cannot remember which one..
Wow, the cooking way of this dish is great, I’ll try it later and I hope it tastes delicious. Just one suggestion: If you add some cooking pictures it will be easier to follow! Looking for a serious red wine for pairing? It has been suggested elsewhere to use an Argentinian Malbec, preferably a reserva..
Open to air for a bit, then drink. Don’t pay more than 15 dollars.